A wonderful Indian whisky which takes its name from the “fusion” of Indian and Scottish barley it uses. 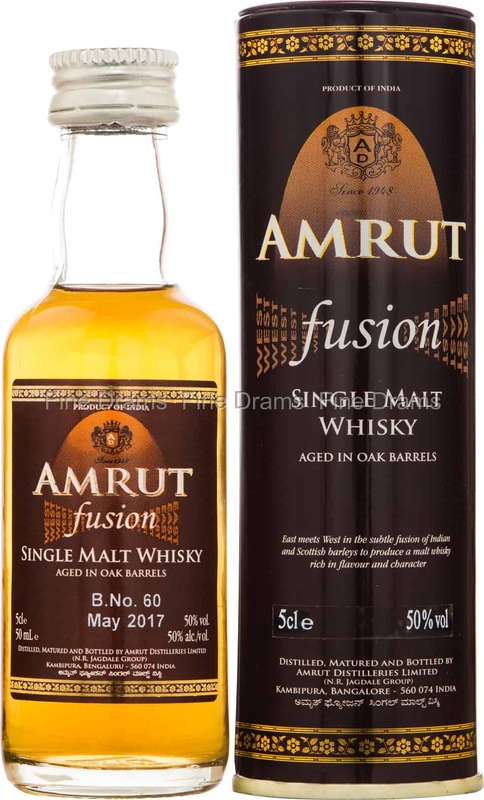 Amrut Fusion was first launched in 2009, and has been hugely popular ever since. The Scottish barley used here is peated giving this dram a wonderful delicate smoke (with the peated barley providing only 25% of the mashbill, to ensure it doesn’t overwhelm the whisky). The result is a finely spiced and smoky whisky, with a touch of tea tannins, stone fruit, cracked black pepper, lemon rind and toffee. This handsome miniature gives the drinker the opportunity to try before you buy – always a smart move!